This was a very exciting challenge for me. Exciting because I’ve always wanted to make my own tiramisu, but challenging because I never expected to have to make all of the individual components from scratch too. I mean, even the mascarpone cheese! And the added bonus of zabaglione. Seriously?! But amazingly, I did it! And I have to say, from a completely biased position, it was one of the most delicious recipes I’ve ever produced. I’m still working on my presentation skills, and trying to get the things I make to look perfect, but on flavor alone I was pretty damn proud of myself. The Daring Bakers’ challenge is a really exciting activity, because though I have a super busy schedule, I’ve got a whole month to get this thing done, and it’s always something that I wouldn’t make without some serious motivation. 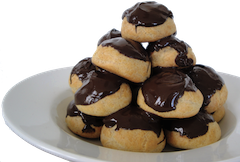 With Daring Bakers, I have no choice not to make it, so I do, and it’s incredibly rewarding. Even though this is only my third month, it was by far the most rewarding process and result. I took about 100 pictures, and had my family trying tastes at every stage — it was so much fun! It took days — literally — to make, but it was so completely worth the effort. I made the lady fingers (which I found out aren’t actually that tasty on their own) on Thursday, the mascarpone, pastry cream, and zabaglione on Friday, and assembled everything Saturday morning so it could sit for the day before being served Saturday night. I was daring and I decided I was going to invert the entire thing when I finished, which was honestly a bit daunting, but ultimately came out looking so cool! The first step was the lady fingers, and I had to make those in my dorm. As most people know, dorms aren’t exactly set up to be culinary meccas, and my room is no different. You can barely fit one person and a cutting board in the kitchen, never mind one person and her entire arsenal of baking utensils and ingredients. But somehow I managed to clear enough space to whip together these cookies, and I got to use my new cake-decorating pastry bag (and fun flower tip) and my pink handheld mixer. The ladyfingers were a lot easier to make than I’d thought, and they seemed pretty fool proof. The later batches melted a little bit, so they weren’t as pretty and fluffy as the first couple of batches, but I used my silpat which always makes such a huge difference. After all of the batter/dough (which is it?) was baked off, the results were encouraging. Step one was complete! The next step was a bit more daunting — to make all three of the creamy components for the cream base. Before this challenge, I’d have never thought to make my own cheese — I’ve looked at recipes for homemade ricotta and mascarpone before, but never really considered it. Those seem like the types of ingredients that you hit up the market for — otherwise, what’s it there for?! But a challenge is a challenge, so I set out to make it, and after some very unsuccessful cream-heating, the mascarpone came together perfectly, and after putting a soupy mess to strain overnight in a cheesecloth, I woke the next morning to a beautiful, creamy cheese, and do you know the best part? It tasted exactly like mascarpone cheese! It was magical, and I completely mean that. Next came the zabaglione, which came together in a flash. One second I was swirling some egg yolks, marsala, and sugar over a double boiler, and the next second I had a luscious and very intensely flavored custard sitting in front of me. It was unlike anything I’ve ever tasted — the flavor was very rich and powerful, but so incredible. How neat! I love discovering new dessert elements. Last for that night was the pastry cream, which I was least worried about, because I’ve made pastry cream many times in the past. This cream was a bit different, but it still came together nicely, and had a smooth lemon-vanilla flavor. Upon it’s completion, I took a final few photographs, then wrapped up my creamy components and set them outside in the bitter cold to “chill” (yes, pun intended) for the night. Everything had come out well, and with the exception of my worries about how the mascarpone would set, I was content enough to sleep like a rock. Being in the bed that I’ve slept in for who knows how many years sure delivers a good night’s sleep — there’s nothing like home. Before I tucked in, I set out ingredients for The World’s Best Coffee Cake. That would be priority #1 for the morning, followed by Operation: Tiramisu. I was back at it bright and early, and had the cake in the oven before my Mom even got out of bed! The timing was impeccable. After the cake was completed (and quite happily consumed), I made the espresso syrup for the tiramisu, checked the creams (all looked great! ), and picked a pan for it all to go into. The rest from here is pretty much history — I followed the recipe, and ended up with a big casserole dish full of espresso-soaked cookies and the creamiest, most delicious, most decadent (my Dad’s favorite word) filling. You can be sure I liked those bowls until there was nothing left. After dinner I flipped the tiramisu over, holding my breath the whole time. But there was no need — it unmolded perfectly, and it was such a beautiful sight. It was the icing on the cake (or the cocoa powder on the tiramisu, if we’re being technical here) to see it come out so perfectly. I just had to parade it through the dining room before photographing — usually I don’t like to show off, but this time I was o proud of myself. After that, it got a generous dusting of cocoa, and it’s 5 minutes of photographing fame. Good thing I got those first pictures too, because the second I “sliced” into it, the entire masterpiece became a giant pile of cookies and cream. Not that I’m complaining. It easily served 10 people, but with no leftovers! That fact was quite disappointing, but hearing the praise and seeing all of the happy faces was enough reward to make up for the lack of leftovers. 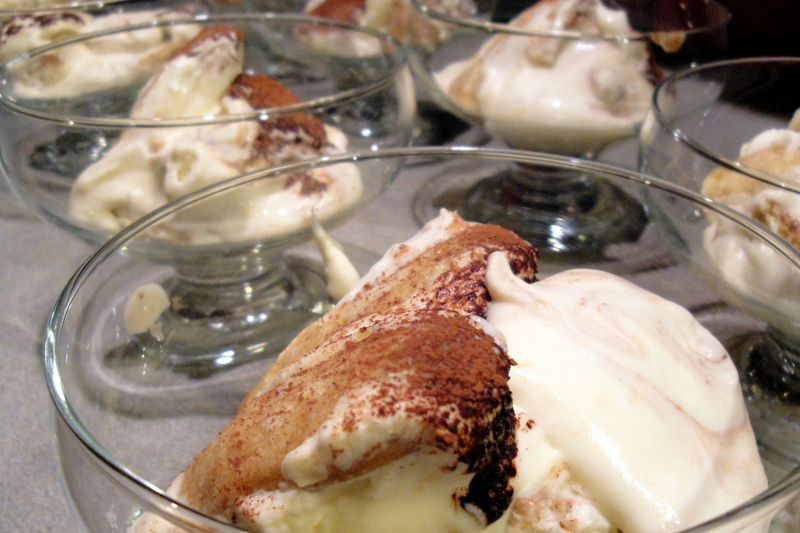 I’ve always loved tiramisu, but this has brought the idea of tiramisu to a whole new level. It’s a commitment, but it was so worth it. And I feel like I genuinely accomplished something. Store them in an airtight container until required. They should keep for 2 to 3 weeks.